Moto Z2 Force Edition and 360 Camera Moto Mod launched. Today Moto introduced Z² Force Edition, its most advanced smartphone ever and a new Moto Mod that lets you capture everything, literally. The new Moto Z² Force Edition shatters limitations with a screen guaranteed not to crack or shatter, a slim, all-metal design, dual 12MP cameras and the fastest possible data speeds. Most smartphone owners have experienced the pain of breaking their screen. With Moto ShatterShield technology, you don't have to worry anymore, with a 5.5" Quad HD AMOLED display that's guaranteed not to crack or shatter. And the new Moto Z's thin, polished design is reinforced with the strength of 7,000 series aluminum. Two cameras mean twice the focus. Now you can focus on what's most important and take professional looking photos with dual 12MP cameras, one monochrome and one color. These cameras work together to capture brilliant, top quality photos. You can even shoot like a pro by adding a blur effect to the background or foreground of images, thanks to the two cameras that enable true depth of field. The new Moto Z's all-day battery allows you to keep going without searching for a power outlet, and when it is time for a boost, add 8 hours of power in just minutes with TurboPower charging. With the powerful Qualcomm Snapdragon 835 Mobile Platform, the phone also features unbeatable performance, instant responsiveness, and the fastest possible data speeds with Gigabit LTE, allowing you to download large files and apps in no time, or stream music and videos - even in Ultra HD. This means no more waiting for pages to load, so you can surf the web effortlessly. Just like Moto Z² Play, Moto Z² Force Edition features latest Moto Experiences including night display that automatically adjusts your screen to warmer tones at night and instant queries in Moto Voice that provide helpful information like the daily weather or calendar updates. Also the front fingerprint reader with one button nav lets you quickly navigate your phone. And because this new Moto Z is also compatible with Moto Mods, you control your mobile experience. Use your phone to interact with the world around you in new ways - instantly transforming into a 360° camera, gaming console, powerful stereo speaker, video projector, battery powerhouse and more. Simply snap the new 360 Camera Moto Mod on your Moto Z and turn it into a 360-degree camera that captures everything. With the click of a button, you can record interactive 360-degree 4k video featuring immersive 3D audio. This allows you to truly relive the moment when it's time to play back your videos - because just like real life, the audio will follow the direction you're viewing. You can also capture a whole new perspective with 150-degree ultra-wide-angle still front and rear photos. Easily edit your 360-degree photos and videos from your Moto Z with advanced editing software that allows you to adjust content to fit your unique needs. Once they're ready to be viewed, simply share your photos and videos with friends and on social media right from the Google Photos app. And you can stream live across social channels, letting the world experience the moment with you anywhere, anytime. This means Moto Z² Force Edition will be available at AT&T, Sprint, T-Mobile, U.S. Cellular and Verizon, in addition to Best Buy and Motorola.com. Pre-orders begin today and it will be available August 10 starting at $30 per month. 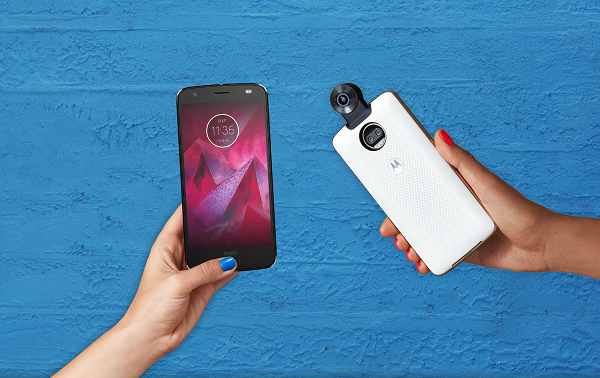 For a limited time, when you buy one, you'll get a free Insta-Share Projector Moto Mod by mail. The new Moto Z² Force Edition will roll out in Mexico, Brazil and various countries in Europe, the Middle East and Africa starting later this summer. Moto 360 Camera will be available globally for $299.99 USD (MSRP) beginning August 10.